Accurate restoration completed in March 2015, in respect of the original features, bright and welcoming, in the center but in absolute quiet, overlooking quiet gardens and rooftops, nice. In the heart of the charming Piazzetta Bergamo Holy Spirit is in the historic village of Pignolo. You can forget the car: the location is perfect for exploring the city on foot, the apartment is in the pedestrian zone in the center, located between the Accademia Carrara, the GAMEC, the Museum Bernareggi and the Teatro Donizetti. La Porta S. Augustine (Upper Town) is just a few minutes along Borgo Pignolo. The central station in ten minutes, the bus stop is 20 meters. The bus stop that connects directly to the airport of Bergamo is also accessible on foot. Supermarket, pharmacy, banks, restaurants, bars, ice cream parlors, piadineria, bakery, cafes and shops downstairs. Great parks nearby including the historic Park Suardi equipped with games for children, table tennis and games and token Marenzi Park with its many plant species and the Park S. Agostino directly on the Venetian walls with its lovely views of the lower town, the playground and basketball court. Italian and international TV, wi-fi, microwave, kettle, linen provided. Visited beginning of April 2017. 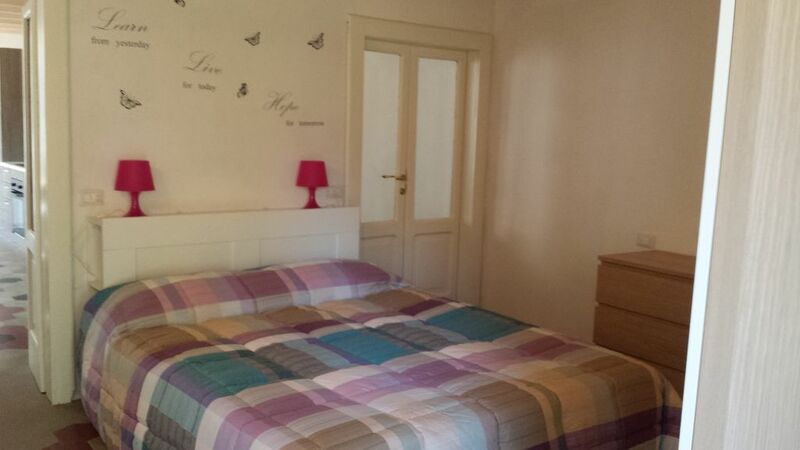 Comfortable, clean apartment, with quite spacious living/dining/kitchen area. Bedroom very pleasant with a view out over trees and garden. Location is very good: 20-minute walk from train station and 20-minute walk to the upper city (a little shorter if you use the funicular), so you get a good taste of both lower and upper Bergamo. Adelissa was out of town for our visit, but was quite responsive by email. Veronica met us at the apartment right on time, was very helpful and answered our questions. We enjoyed Bergamo tremendously. Wish we could have stayed much longer. Clean, quiet and well located inside Bergamo. Extremely clean, quiet and well located downtown in a pedestrian street. We appreciates a lot to stay in this appartment with a nice view on a garden. 15mn by walk up to Citta Alta and the housing is very near all accomodations. No specific problem to park our car. Consequently we advice it. L'appartamento è ubicato in un luogo invidiabile, in pieno centro storico, a due passi c'è tutto, il ristorante, il supermercato, il tabaccaio, il bar ecc. Se si ha un' auto diventa un problema perche non ci sono posteggi gratuiti nelle vicinanze. La casa è graziosissima, ben tenuta, pulita, e fornita di tutti i confort, la signora Adelisa è premurosa e sempre disponibile. Che dire altro ?? Merita cinque stelle piene. The Owner was super attentive in all , and very predisposed to help-us.